God promises to restore the fortune of the off spring of those who are in the line of David. God is talking to Jeremiah about the people of Israel and is telling Jeremiah He, God, is going to return the people’s prosperity, which they lost when they went into captivity. You and are in the line of David. Jesus is the heir of David that seats on the eternal throne and we are in Christ and He is in us. 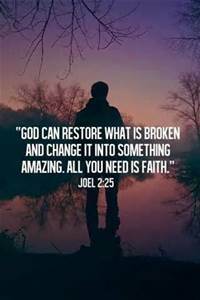 Therefore, the promise of restoration of prosperity is ours too. Not just financial prosperity but spiritual, mental, emotional and physical prosperity will be restored to us. In addition to restoring our fortune, God will also have mercy on us. Now ain’t that good news! PRAISE GOD…FOR HIS MERCY IS EVERLASTING!!! !